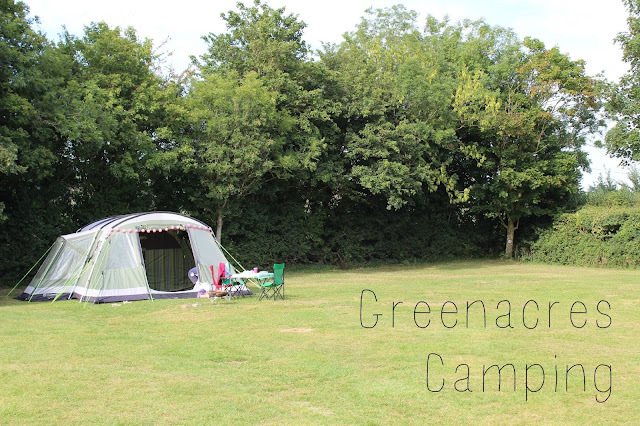 Camping is always high on our agenda in the summer holidays and this year we decided to head back to the glorious Greenacres Camping, just an hour's drive away, in the Somerset countryside near Pilton. This site to me is just perfect; flat, huge pitches, camp fires, hot showers, tents and campervans only and simple! The prices are reasonable too at £9 a night for adults and £4.50 for children - with no extra charges for gazebos, awnings or big tents. We arrived early Sunday afternoon and was greeted at Reception by the lovely owner Mary, who remembers all her past guests, and with a quick reminder of where our pitch was we were good to go. As my car is teeny the husband brought the camping gear in his van, helped us pitch up and then left us to it - the joys of running your own business hey?! The pitch gave us plenty of space for our Outwell Montana 6 tent and car with ample room left to spread out away from neighbouring pitches for those quiet moments when you just want to chill outside your tent. Being at the end of the site we were away from the play park and amenities block but this meant no passing foot traffic and a quieter camping experience - and now the children are 9 and 7 they have increased independence and confidence to head to these areas without me holding their hand and watching their every move. 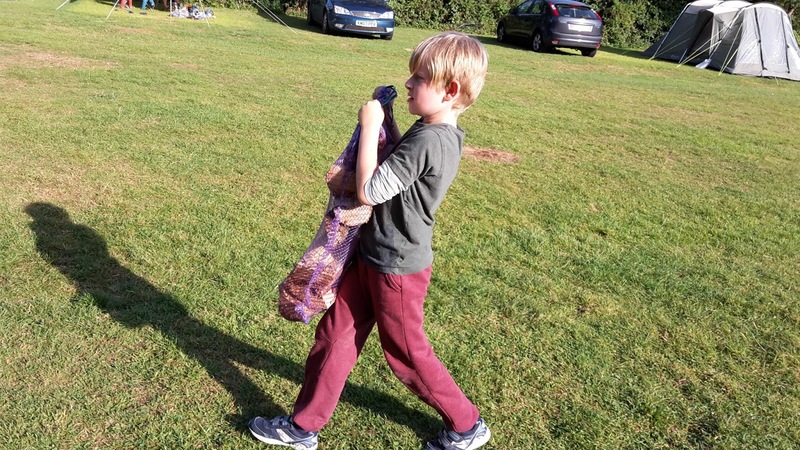 Every camping trip we take I see a big change in the children and Greenacres has been part of their camping experiences since they were 3 and 1. The space and safety of the site has allowed them to explore and step away from the grown ups, it has made them more confident and just being outdoors in the fresh air 24/7 allows them to completely switch off with no mention of television, iPads and tablets. This to me is pure bliss. The site has a play area with swings, slide, see saw and play houses and The Lazy Dayzee Crew come on site a couple of days a week to do craft activities in their lovely belle tent. The weather was varied with us waking up on Monday morning to heavy rain but we were prepared. I had my lovely new Helly Hansen Seven J jacket and Veierland wellies which kept me super dry on the walks to the toilets, shower block and washing up area. The rest of our trip was dry and sunny which enabled us to have a campfire every night. I was a little bit anxious about this having never started a fire before but Zippo sent me a rather useful kit that helped us to safely start the fires. The cedar wood fire starter was fantastic and so much nicer than the foil wrapped supermarket ones. Greenacres hires out fire pits with wood, firelighters and kindling with prices starting at £20. We had our old BBQ pan so just bought some wood from the helpful Duncan at Reception - £10 for a big bag of logs and kindling. 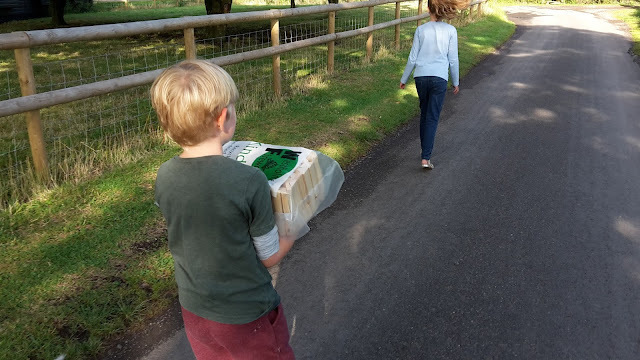 You will see Duncan driving his mower and trailer around the site regularly dropping off fire pits and wood but I handily had a strong seven year old boy to do the carrying for me! Sitting round the campfire each night with the children is going to be a memory that will last forever; toasting marshmallows, sipping wine and hot chocolate, watching the flames dance, burning sticks. All simple things. The site is well placed to visit the nearby towns of Wells and Glastonbury as well as the tourist spots at Cheddar and Wookey Hole. We also headed further afield down to Montacute House on the rainy Monday and across to Brean Down for a lovely sunny day of play on the beach on Tuesday. Wednesday we climbed Glastonbury Tor, wandered around the beautiful shops buying incense sticks and essential oils then drove up to Wells for an ice cream in front of the Cathedral. We were very sad to leave on Thursday, although chuffed that the weather forecast of torrential downpours from 4a.m. were completely wrong. The husband arrived to take our camping gear and Duncan was doing his rounds on his mower freshening up the pitches for new arrivals and it was a cheerful goodbye and hope to see you again. We definitely hope to see you again Greenacres and we will be back for a bit of slow living camping. Picture kindly taken by our friendly Dutch neighbours!